Perfectly cooked crispy bacon in the oven. This oven bacon recipe shows steps to use a foil lined baking sheet, and my #1 trick to keeping your oven clean. Also, how I like to save the bacon grease. See Notes to find out a different technique to keep your oven completely clean while cooking bacon in the oven! Lay the raw bacon out on a sheet pan. Place in the middle of the oven and turn the oven on to 400F. Cook the bacon until crisp, about 30 minutes (or until it is done to your liking) Remove from the oven and drain the bacon on a plate lined with paper towels. You can line your baking sheet with a wire rack, parchment paper, or foil. The parchment paper and foil will aid with cleanup and the wire rack will help you avoid draining on paper towels. Save the bacon grease in a glass jar with a lid. Using a sieve, strain the solid pieces from the bacon grease and store in the refrigerator. Store leftover bacon in an airtight container in the refrigerator for up to 1 week. UPDATE! 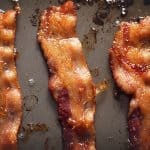 You guys I have a massive trick to keeping the bacon from popping grease all over your oven! If you are a conservationist, i'm sorry. I bought a shiny new oven and I did not want to mess it up with bacon grease like my old oven. So this is what I do now. I place the bacon on the baking sheet and then I cover the bacon with parchment paper. I cook the bacon at 350F until it is crispy. This takes about 30-40 minutes at 350. I've been doing this for over a month and my oven is still spotless!